From all of us at ANSYS, we want to congratulate the team of Emirates Team New Zealand who just won the 2017 America's Cup. Wining the America's Cup is a feat in sailsmanship, a feat in teamwork, but also a feat in engineering. What I love during the America's Cup season is that all of my colleagues and friends ask me about the competition as if I was an expert (Hint: as you can see on the picture, I am a more of a Sunday sailor than a high tech boat skipper). What I can talk about, however, is some of the technology behind the amazing boats that compete in the America's Cup. First, check out this video to understand what I mean: the boats fly over the water thanks to foil. Notice that there is no main sail — rather it is a main wing. Let's learn more about how ANSYS simulation enables the development of those amazing racing machines. Emirates Team New Zealand (ETNZ) has been using ANSYS technology for many years — ETNZ is supported by ANSYS channel partner LEAP Australia and composites design specialists from ANSYS. Let's focus on how simulation is used to design the main sail.. I mean the wing. Then full story can be found in this excellent article written by Steve Collie, ETNZ Aerodynamic Engineer. ETNZ uses a 100% simulation-driven development process to test thousands of designs. Below are a few examples. CFD simulation. This is a race so you want to go as fast as possible. The same way CFD is used to compute lift of an airplane wing (lift = what makes the plane fly), CFD is used to compute the America's Cup wing lift (this lift is the one that propels the boat). Structural simulation of composites. The boats are flying on the water — it is key that they are as light as possible. As you can imagine, the wing ribs and beams are not made of steel but rather of composite materials. Structural simulation of the behavior of those composites parts is key. 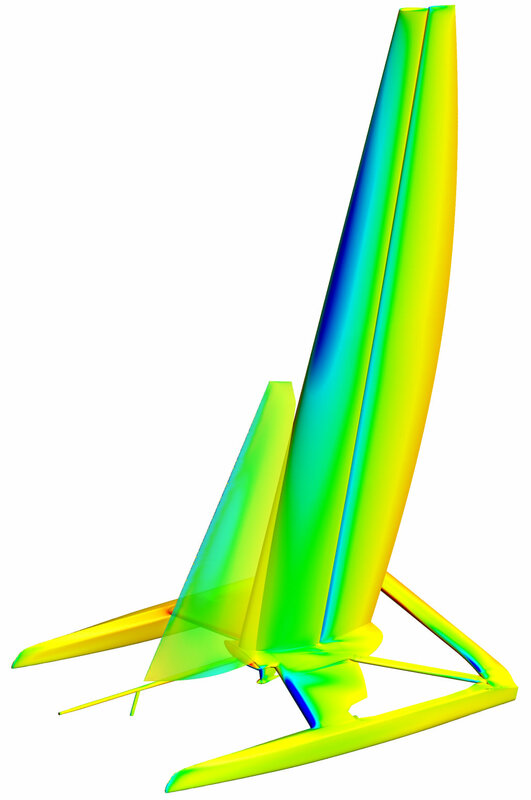 Check out how ANSYS can simulate composites material. To learn more, look up the ANSYS Channel Partner Program.